“I’m not affiliated with the DC Preservation league but saw the link to the petition. I added some additional context. Need your help to save the Foundry Branch Trestle Bridge. It’s a really cool historic trolley bridge near our apartment that will hopefully get re-purposed for a multi-use trail. I already signed it and you should too. At the very least it’s a cool video. “Built in 1896, the Foundry Branch Trolley Trestle is one of the few remaining pieces of the old streetcar system that carried District residents around the city for a century, long before the DC Metro System existed. The trolley line it served, ran from Georgetown into Glen Echo, Maryland, transporting thousands of Washingtonians to the Glen Echo Amusement park, connecting and developing the communities in its path, and allowing its riders to enjoy the scenic views. 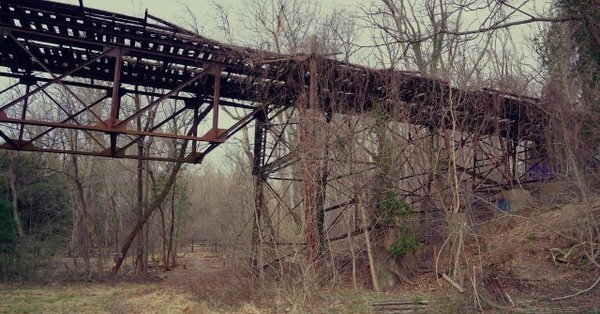 The last trolley car crossed the Trestle in January of 1960, after which the bridge was abandoned for 37 years, until the Washington Metropolitan Area Transportation Authority (WMATA) acquired the trestle in 1997, intact but in need of maintenance. Nine years later, in 2006, the Trestle became a contributing structure to the Glover-Archbold Park Historic District, which was added to the National Register of Historic Places in the following year. The Trestle remained popular with both pedestrians and cyclists, who continued to cross over and under it. However, after years of neglect by WMATA, it is in significant disrepair. The deterioration is so drastic that part of the southern area of Glover-Archbold Park is now inaccessible to pedestrians and cyclists, after reports of debris falling from the Trestle. The DC Department of Transportation (DDOT) is in the process of completing preliminary designs for the first phase of a multi-use trail along the former streetcar line between Georgetown and Glen Echo. Much of the project will focus on the rehabilitation of the Historic Foundry Trestle Bridge for use by pedestrians and cyclists. Unfortunately, instead of allowing DDOT time to complete these plans and produce a solution, WMATA applied for a permit to demolish the Trestle, which would be an incredible loss for both historic preservation and for residents and visitors who enjoy outdoor recreating in our city. WMATA’s own 2017 inspection of the Trestle revealed that 19 of the Trestle’s 22 vertical supports could be repaired and that the remaining three replaced in-kind. While the structure’s present condition is poor, it is demonstrably repairable. DCPL believes the Trestle has the potential to be revitalized as a historic attraction and a pedestrian and cycling path. Instead of allowing WMATA to demolish this historic site, we ask the community to sign the DC Preservation League’s petition asking Mayor Bowser to #SaveTheTrestle, allowing DDOT to complete its trail planning that could save this endangered site and return it to productive use for the greater Washington community to fully enjoy.